I have been fortunate enough to find and see a ton of rare birds lately. I am not even a bird watcher, I just recently have happened to stumble upon Great Horned Owl, Wild Turkey, Domestic Turkey, and now Pheasants!! 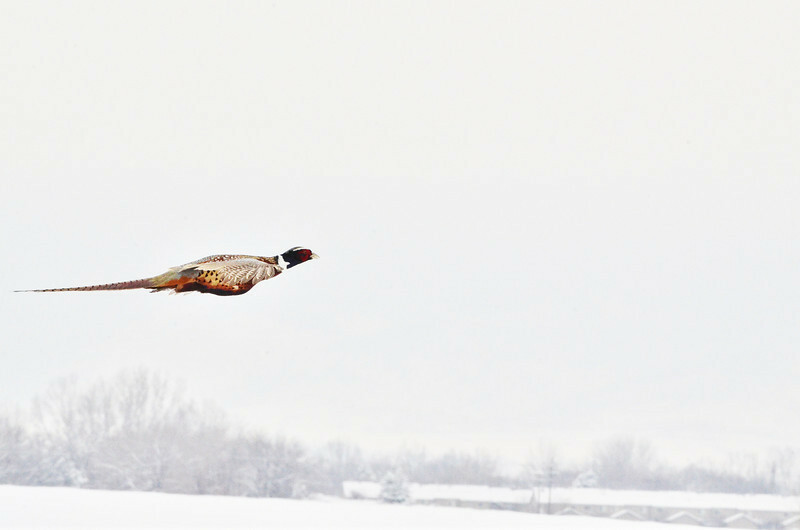 My buddy and I were driving down the road in a truck (he was driving) when suddenly the truck spooked up a pheasant that flew beside us for a good 300ft. This bird flies incredibly fast. We were doing about 40 while he was cruising along side of us, which turned out to be the perfect chance to shoot a photo of this wonderful critter in flight. Great catch, I'm sure these stupid birds are bred to fly so they they can be shot easily, they do the same over here! Wow, what a catch - fantastic!